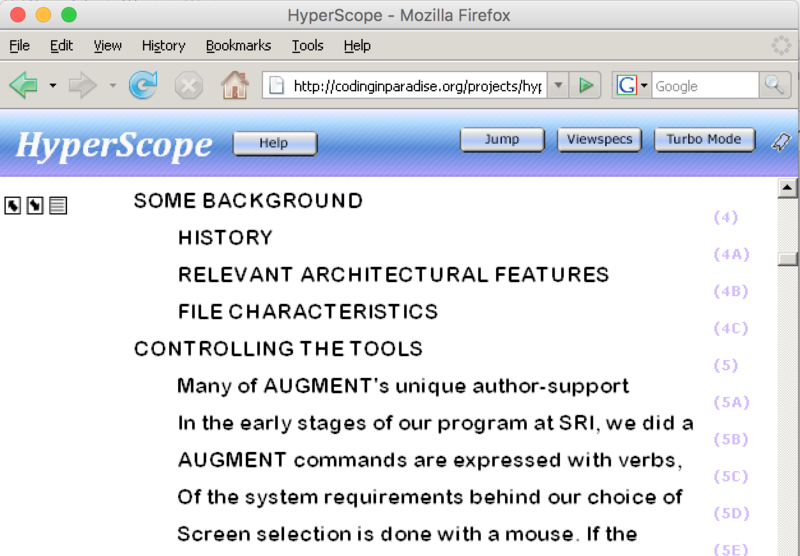 Hyperscope is a browsing tool that enables most of the viewing and navigating features called for in Doug Engelbart's open hyperdocument system framework (OHS) to support dynamic knowledge repositories (DKRs) and rising Collective IQ. 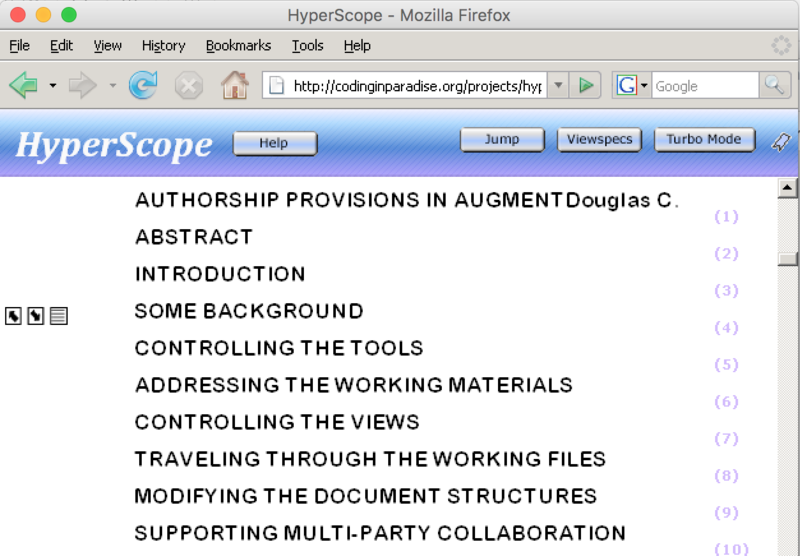 See Resources below for links to HyperScope demos, downloads, tutorial, etc. Purple numbers on the right are supplied by the browser automatically for each paragraph or object allow for precise jumping, navigating, and linking. Jump Button allows you to jump by number. Click on [Jump] and type in a paragraph number or click on the desired paragraph, and then confirm with [OK]. Turbo Mode switches you to an advanced user interface mode, removes the training wheels (the zoom, jump, and viewspecs buttons) into a natural language command mode -- type "ji" for Jump Item (replaces the Jump button) type in a paragraph number or click on desired paragraph, and at the "V:" prompt you enter the viewspec shortcut codes for the view you want when it jumps and confirm with [Enter]. Try "sev" for Set Viewspecs (replaces the Viewspecs button) and enter the viewspec shortcut codes, confirm with [Enter]. There are many more commands. To get back to the push-button browser mode, click [Browser Mode]. Bookmark icon allows you to create a link to the view of the file you are currently seeing. Just click on the Bookmark icon to copy the complete link, and then click over to a window where you want to insert the link and Paste it there. The link includes the precise paragraph number and the viewspec shortcut codes so anyone who clicks on that link will arrive at this same spot in the file with this same view. 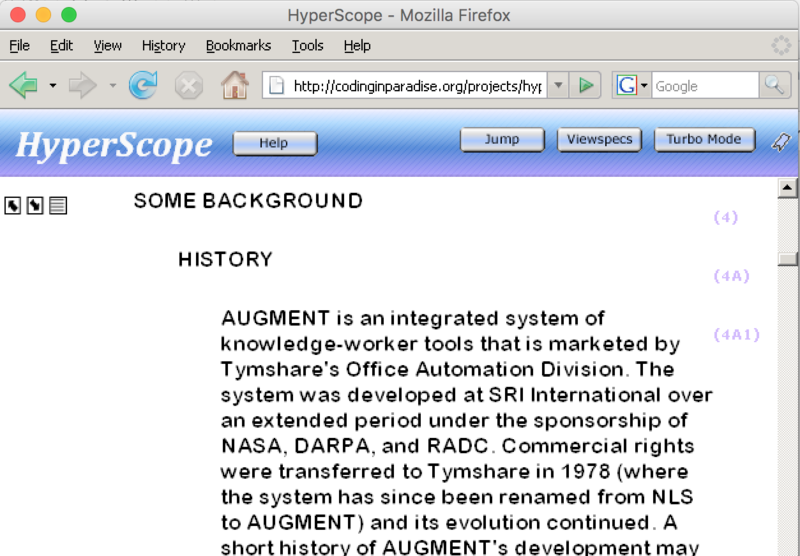 Visit the HyperScope project website at hyperscope.org to learn more and try it yourself.